This book was written by Mrs. Helen Watson Burns in 1975 in honour of the centennial year of the Exhibition. It is available at the Chatham Kent Public Library in Dresden. The Kent County Almanac of 1883 supplies us with a description of the first County Fair. “It was held on a common, now the site of the Rankin House, with the blue sky overhead and the frozen ground under foot. No board fence separated it from the outer world; free to all! The cattle and swine, of lanky and angular lines, stood round in isolated groups of two or three, moored to a convenient stump, rail fence or cartwheel. Interspersed with these, the more attractive sheep were penned against the carts and fences; while tied to vehicles or held by attendants, were fair-looking horses, many showing the blood of Indian ponies. Surrounding the whole and lining the streets stood ox-sleds, French carts and other vehicles, with saddled horses more numerous. In the palace (a shanty), or on the ground, stumps or boxes, stood a few bags of grain, a butchered hog, a few samples of cheese and butter, and the inevitable web of home-made flannel.” Patchwork quilts, implements or vegetables were not yet present. The prizes were furnished by donations previously secured, with no grants yet given and the total prize list for 1843 was 21 pounds, 10 shillings, about $86, with 45 prize winners named. A Camden Fair was held at Dawn Mills in the Kent militia drill shed, which was moved to Dresden and set at the middle of the street along the west side of Market Square. The Camden Agricultural Society was organized on April 26th, 1876 and was incorporated in 1891. 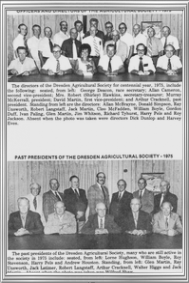 This became The Camden-Dresden Agricultural Society in 1934, and finally the Dresden Agricultural Society in 1946. 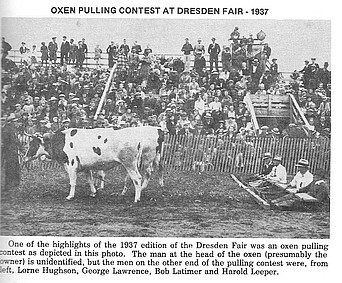 The fair was known as the Dresden Fair until March of 1960 when it officially became the Dresden Exhibition. The first land transaction involving the fairgrounds took place in 1827. The grounds changed hands over the years, passing through one Josiah Henson in 1845. The Agricultural Society took ownership in 1891. In 1911 the buuildings on the fairgrounds consisted of a main hall, grand stand and a ticket office. The present grandstand was constructed in 1976. 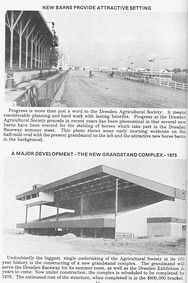 The Agricultural Society also played a part in the building of the Lambton-Kent Memorial Agricultural Arena, which sits on the Society’s property as well as the OLG Slots building. The Track Kitchen and horse barns have all been added over the years. Behind the Slots building is the horse ring which the Dresden Saddle Club has full access to. The first meeting on record of the Camen Agricultural Society was Saturday, July 11th, 1891. The fair was held in early October with gate receipts of under $200 and the amount paid out for prizes alone nearly $500. Expenses for the fair included $15 for the Dresden Band, $12.50 for the Tupperville Bannd, with the added expense of $5 for their railroad fare and $6.25 for their dinners at the Clifford House, as well as “telephoning, 50 cents”. 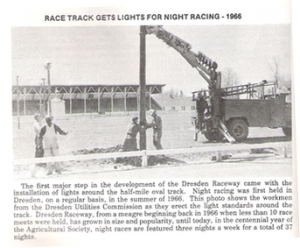 Sources of income included renting the grounds and the track to the Dresden Driving Club for races, $40 for the Bicycle Club and renting the grounds for pasture. The first”merry-go-round” at the Fair was in 1923, with midways showing up in later years. Entertainment consisted of donkey baseball, chariot races, horseracing, pulling matches and music. In 1913 the racetrack was surveyed and made into a regulation track. 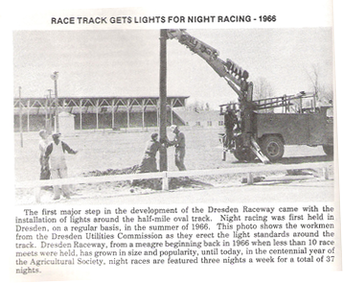 Lights were installed all around the track to accommodate night racing. Horse racing has always been a part of the Dresden Fair as well as the horse show. In 1932 the “Foal Club” had 21 entrants; Arabians were added to the classes in 1966. Cattle were a large part of the fair also, dating back to 1933 with the Calf Club which had 17 members. Yokes of oxen were added in 1936 and records from 1953 show the Dover & Chatham 4-H Club’s involvement. The Fair Princess and the Miss Dresden Exhibition began in 1974 with 11 contestants. It was 1911 that penmanship was first put on the prize list because of a recommendation from the Central Business College, Toronto. The first mention of a baby show was in 1915. Garden displays was a new class in 1922, as well as corn. 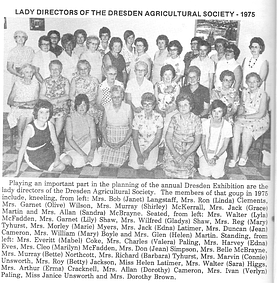 Many things have changed over the years with the exception of many dedicated people working tirelessly to keep the legacy of the Dresden Agricultural Society and its’ mission alive and prospering for the benefit of the agricultural community.